Professional Regulatory Commission and the Board of Professional Teachers release the much anticipated Licensure Examination for Teachers result in Elementary Level 51 working days after the test was given. PRC had announced that out of 70,786 examinees, 25,301 elementary teachers(35.74%) had passed while 26,767 secondary teachers out of 77,803 examinees (34.40%) successfully passed the Licensure Examination for Teachers (L.E.T.) 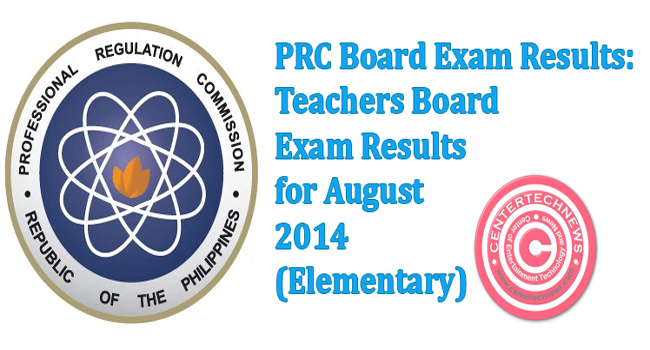 given on August 17, 2014 in Hong Kong and 24 testing centers all over the Philippines. As announced, the 25,301 elementary teacher passers are the combined numbers of 21,649 first timers and 3,652 repeaters. For the secondary teachers, 23,820 passers are first timers while there are 2,947 repeaters. Republic Act 736 mandates all teachers to pass the LET to practice in their field. As cited in the law, the state recognizes the important roles of the teachers in building and developing the nation through responsible and literate citizenry. The state aims to ensure the regulation and supervision of the practice of teaching. This year the last LET was held on August 17, in testing centers all over the Philippines including the provinces of Cebu, Davao, Jolo, Sulu, and even in Hong Kong. The test was made by the Board of Professional Teachers Dr. Rosita Navarro as the Chairman, and the members Dr. Paz Lucido, Dr. Paraluman Giron, and Dr Nora Uy. The LET for Elementary Level consists of 2 parts: 40% on General Education and Professional Education takes up the 60%. The major areas of General Education are English, Science, Filipino, Mathematics and Social Studies while Professional Education consists of teaching profession, principles of teaching, assessment of student leaning, field study,developmental reading, practice teaching, child adolescent development, facilitating learning education technology and curriculum development. The examinee must have an average of not lower than 75% and no rating of less than 50% in any subpart of the test. After the expectation of the test result release had risen each day especially that Regional Director of PRC Baguio Teofilo Gaius Sison Jr. said that the official result would be out after 20 working days, the result is finally out to the public. On September 12, PRC had earlier given a heads up for those waiting for the list that they would update their IT Systems on the whole day of September 14, Sunday.